We’d love your help. Let us know what’s wrong with this preview of The Connected Company by Dave Gray. Customers are adopting disruptive technologies faster than your company can adapt. When your customers are delighted, they can amplify your message in ways that were never before possible. But when your company’s performance runs short of what you’ve promised, customers can seize control of your brand message, spreading their disappointme The future of work is already here. Customers are adopting disruptive technologies faster than your company can adapt. When your customers are delighted, they can amplify your message in ways that were never before possible. But when your company’s performance runs short of what you’ve promised, customers can seize control of your brand message, spreading their disappointment and frustration faster than you can keep up. To ask other readers questions about The Connected Company, please sign up. Having lived my life in and through the network, Dave’s book hits a sweet spot for me. It’s layout, structure and format make it so easy to read and use – a huge plus! First, being a lover of etymology, I love Dave’s elaboration of Product as a Service Avatar on many levels. First, it’s so so true and second, the basis of the word avatar. So, second first – Avatar comes from Sanskrit. Ava means descent, coming down and Tatari means crossing over. Analogies of diving to flesh, energy to matter ar Having lived my life in and through the network, Dave’s book hits a sweet spot for me. It’s layout, structure and format make it so easy to read and use – a huge plus! First, being a lover of etymology, I love Dave’s elaboration of Product as a Service Avatar on many levels. First, it’s so so true and second, the basis of the word avatar. So, second first – Avatar comes from Sanskrit. Ava means descent, coming down and Tatari means crossing over. Analogies of diving to flesh, energy to matter are spot on. Second, first – product as a service avatar. Think of how we name and use products. Dave reminds us of iron, brush, bottle, ladle, drum – these are nouns and verbs! Think of products as job descriptions (hence, “jobs to be done” per Clayton Christensen) – blender, washer, heater, etc. Companies must learn to become part of their customers’ lives – part of their network. Most companies today see their role as bringing customers into their network – that’s backwards. So this implies some structural changes. Most current companies are structured for efficiency over effectiveness, for repeatability over adaptability. However, in an increasingly complex and light-speed world, this won’t work too well. If effectiveness matters, than purpose is front and center – otherwise how do you know you’re being effective? So the focus has to be on being mission-driven, assessing your success frequently which means learning which means trying a lot – otherwise known as experimenting. The more we experiment, learn, apply and iterate, the higher probably of achieving the intended outcomes for our customers – our purpose! Obviously, with a changed structure, a more adaptable structure for this century and for connecting with our customers, the traditional roles and responsibilities may need to change as well. To date, management has been an operating system – the system. Not so much going forward! Dave shows us how management needs to be a support system, a means, not an end, to consistently delivering more and more real and meaningful outcomes. The power of management lies not in its control, but in its connections. Now, you can say that I’m partial to Dave’s book given my writings on and passion for networking and you’d be right. Perhaps that’s why I find this book so necessary for today’s world – because we need to view our organizations, our companies as part of a network, a connection – there to connect and to facilitate connections. And, yes, I’ll admit, the fact he referenced one of my idols, Albert-Laszlo Barabas sure did help! Read Dave’s book – get a digital and physical copy because you’ll want to mark it up, pass it around and use it like workbook – at least you should! Summary: A compelling survey and manifesto that unifies a lot of specialized concepts into one organized whole. I really hope we begin to embrace "The Connected Company" not necessarily as Dave Gray has defined and outlined them here, but as a philosophy and hypothesis for further development and exploration by leaders, academics, consultants, professionals, and individuals. The connected company is here and we need to shape it. I preordered this on Amazon when I read Dave Gray's blog post "Every Summary: A compelling survey and manifesto that unifies a lot of specialized concepts into one organized whole. 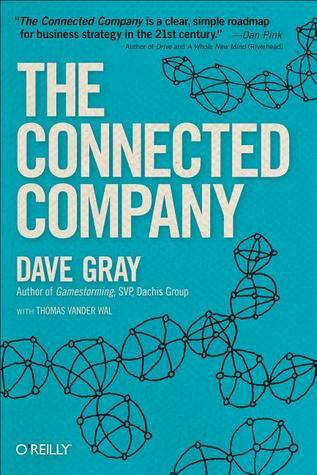 I really hope we begin to embrace "The Connected Company" not necessarily as Dave Gray has defined and outlined them here, but as a philosophy and hypothesis for further development and exploration by leaders, academics, consultants, professionals, and individuals. The connected company is here and we need to shape it. I preordered this on Amazon when I read Dave Gray's blog post "Everything is a Service". I forgot about it and one day the book arrived. It's a flowing read but an involved one. It seems that Mr. Gray, whether intentionally or unintentionally wrote the book utilizing the concepts of his book-- each chapter is organized like a pod. A self-contained thought that in some aspects pretends as if the other chapters do not exist. For example you might see the same citation/excerpt in subsequent chapters rather than referring to the earlier citation. It works here because it allows each concept to build on the other in a modularized fashion. The U.S. management theory hails from the philosophy of Taylorism and The Wealth of Nations, a command and control philosophy. However, the shift towards services and the reality that each of our businesses are actually nodes in a connected 'service network' and in a fractal sense are one 'service network' themselves. These companies that are to themselves networks of people (not 'human resources') need a different approach to being prepared and competing for the new dynamics of competition. Gray encourages, among other things-- pushing knowledge to the edge, smaller team like approaches for getting things done, and on the whole optimizing for adaptation vs. efficiency, or at the very least being more cognizant about the choice. I have to revisit this text but on first survey this is a classic management text, even though it is not written in the same authoritative tone. Sadly, while this might endear its readers, its design, style and layout may ultimately lead this book to 'preach to the choir' as it departs in tone and style far enough from widely distributed business books like 'Good to Great' that it may find circulation in management hallways challenging. The new organization is a network, not a hierarchy. Great argument and well written. Some books are great to read from start to finish, with tons of stuff to enjoy, learn or be amazed by, but perhaps not always in the same package. However, this is one those books that has it all, and it was a real delight to read from start to finish. So where do I begin? First of all, the subject matter for The Connected Company is right at the heart of everything that organisations have to deal with these days; namely, how to adapt the culture of the enterprise to make the best use of a highly Some books are great to read from start to finish, with tons of stuff to enjoy, learn or be amazed by, but perhaps not always in the same package. However, this is one those books that has it all, and it was a real delight to read from start to finish. So where do I begin? First of all, the subject matter for The Connected Company is right at the heart of everything that organisations have to deal with these days; namely, how to adapt the culture of the enterprise to make the best use of a highly connected, fast and fluid business environment. The book is divided into five parts that discuss, among other things: why do we need a connected company; what does it mean be a connected company; how does it work, and how best to lead such an organisation; plus the immediate steps you can take on the path to becoming a connected company. Secondly, one of the authors, Dave Gray, is no stranger to lateral thinking and innovative approaches to business challenges. His previous book on Game Storming (also reviewed by yours faithfully) was a treasure trove of game-related techniques to stimulate innovation, and alluded to some of the themes contained in this new book. The authors’ language and writing style are both accessible and engaging, which makes it easier to grasp some difficult and non-intuitive concepts, as well as making it tougher to put down. 1.A comprehensive look at how changing customer behaviours and employee expectations are bringing about relentless change to the enterprise. 2.A description of the key features of a connected company and how it works like a constantly learning, podular organism by empowering its workforce to make the right decisions, based on clear principles and vision at the point where it is most needed. 3.It explains how a learning organisation’s culture embraces experimentation and how entrepreneurship is just ‘...a method that anyone can follow’. 4.The difference between a leader and a manager, in context of a connected company, plus several real-world examples of how to take that first step into the journey to becoming a connected organisation, for example with ‘pilot pods’. Overall, this was a splendid read, and well deserving of its maximum score (10 out of 10), not least because it’ll resonate with all leaders, managers and employees in most organisations that face the constant battle for change. It is perhaps appropriate to end by highlighting a quote, by Steve Jobs (on page 250), which essentially holds that ‘...you can only connect the dots by looking backwards’ or, to put it another way, innovation is often only understood in retrospect. The first part let me down a bit. It felt incomplete and rushed, lacking detail. However, the remaining parts are worth it. The message resonated with me, having been in a large corporation my whole career. Learning the six-sigma methodology, which focuses on building a process that can be reliably reproduced the same output, it always bothered me that by reducing variation you're not only cutting out the processes that under perform, but your chopping of the processes that excel. This book also The first part let me down a bit. It felt incomplete and rushed, lacking detail. This book also reinforces the concepts on team communication and the benefits of openness that I've come to understand through my experiences at work in building development teams. This is THE best business book I have read this year. Simply put a great read. The book is a manual for the company of today and tomorrow. Glad I read it before starting on a journey as a entrepreneur. And I will make sure colleagues and friends read it. Anyone in a service industry and in education should read this. We should be looking at our work differently. Though there are reasons for developing efficiencies we should be looking toward opportunities and benefits with connected to our customers and others. I just love to learn about better ways to design and structure an organization. This book offers a lot of ideias and invites you to think about new ways to organize people around a goal. I definitely recommend the reading. It is fun and filled with lots of nice drawings. A good overview of how to transform your company to be more fit for the network society. The book is particularly interesting as it contains lots of examples of companies that have turned around in the right direction. There is however a primary focus on large companies which makes it perhaps somewhat less useful for SME scenarios. That's the main reason why I chose to give the book only 4 stars. Grandes corporações ainda podem se reinventar para realmente atenderem as necessidades de seus clientes, criando lugares melhores para se trabalhar, liberando e libertando a criatividade e permitindo conexões genuínas. Uma nova forma de pensar e de lidar com a complexidade! I want to highlight every word. Great insights! Dave is excellent at making complex subjects simple to understand. I enjoyed reading this as much as I enjoy hearing Dave speak at events. Good intuitions, but quite generic and fuzzy in the identification of consequences and guidelines. - Page 246: A company is healthy and sustainable when its primary purpose is creating value for customers. - Page 4: Lowering the size of coffee machines at coffee houses can help users better connect with workers. - Page 225: Developing shopping districts can help people connect with each other. - Pages 6, 8 and 259: Using social media such as blogs and Twitter, people connect and share information. When we make buying decisions, we now first go to each other - using various platforms - before we go to companies. We trust each other more than we trust companies. - Page 81: An open system is continually exchanging information with its environment, taking in information and adjusting based on feedback. - Pages 13 and 16: Growth in developed economies will increasingly come from services. Product saturation, information technology and urbanization are driving the move to services. - Page 219: Support is a key value of https://www.rackspace.com/. Anyone can reach out to anyone to help solve a problem. - Page 48: Few management levels create connections with users. - Page 116: If a customer at a http://www.ritzcarlton.com/ hotel has a problem, any employee has the authority to spend up to USD 2,000 to resolve it immediately without asking a manager. - Page 136: A connected company is NOT a hierarchy. A connected company is autonomous units that operate and evolve independently and are connected to the whole, for example through purpose. - Page 227: Each person, who works for https://www.gore.com/, gives feedback to 20 people and gets feedback from 20 people. - Page 234: Leaders give feedback to anyone, i.e. across levels and across departments. - Page 235: The best stories are stories that inspire and motivate. - Page 49: Lou Gerstner, former https://www.ibm.com/ CEO, encouraged every manager to go to at least 5 of the biggest customers within 3 months, listen to their needs and initiate action to help customers better. - Page 95: Akio Morita, founder of https://www.sony.net/, encouraged designers to watch what people were trying to do in their lives and try to find ways to do those things better, easier and cheaper. - Page 115: Zappos seeks to connect with users by publishing its phone number on every page of its site. - Page 115: To keep only people, who are excited about their work, and promote a user friendly culture, https://www.zappos.com/ offers people USD 3,000 to leave immediately after 4 weeks of training. - Page 171: Apprenticeships are useful ways to help people learn from each other. - Page 184: Social networks include schools, workplaces, churches, clubs, sports leagues, shopping districts, industry clusters, and industry associations. - Page 190: Since networks are highly interdependent, success depends on your ability to build strong, trusting, mutually advantageous relationships with other people in the network. Un excelente libro que comencé a leer pensando que se trataba de otra cosa. Las compañías conectadas son aquellas que se organizan en unidades independientes y autónomas, pero que viven dentro de una cierta norma que les impone algo de límites. Puede tratarse de empresas pequeñas, o de empresas corporativas tradicionales, que es lo que me resultó más interesante. Parece que las prácticas son más aplicables en las compañías pequeñas, pero se trazan algunas soluciones interesantes para las empresas Un excelente libro que comencé a leer pensando que se trataba de otra cosa. Puede tratarse de empresas pequeñas, o de empresas corporativas tradicionales, que es lo que me resultó más interesante. Parece que las prácticas son más aplicables en las compañías pequeñas, pero se trazan algunas soluciones interesantes para las empresas grandes, que requieren básicamente de voluntad corporativa. El autor es realista en cuanto a los alcances y las advertencias de la innovación en la gran empresa (lo frustrante que puede llegar a ser), y como sortear las amenazas. Se habla mucho del concepto de Net Promoter Score, que creo que de aplicarse en grandes empresas, que no forzosamente tienen una cara al público directo, puede tener resultados interesantes. I read this to supplement an earlier book on scaling and networks which I had found underwhelming. It helped a bit but just slightly. The prior caveat shows that my reservations with the book are more personal rather than universal. If it is your first time coming across networks then the book is a good primer. Personally I found it a bit shallow on technical details and relied too much on anecdotal evidence rather than real data. Gray cherry picked examples that suited whatever point he was sel I read this to supplement an earlier book on scaling and networks which I had found underwhelming. It helped a bit but just slightly. The prior caveat shows that my reservations with the book are more personal rather than universal. If it is your first time coming across networks then the book is a good primer. Personally I found it a bit shallow on technical details and relied too much on anecdotal evidence rather than real data. Gray cherry picked examples that suited whatever point he was selling that time. It also had tonnes of white noise and self evident points, further worsening its stead was its extensive use of Amazon as a good example when we know of its predatory techniques and hazardous work environment. Reinforces the point quite well that for a company to succeed it has to be a part of the feedback loop, learn, reinvent and never be complacent about success. It's really is always Day 1. Personally I'm going to relook at how I can increase customer touch points and front-line interactions for my team to try and become a more "connected company". I found the book quite compelling. A must read for every hospital administrator. Perhaps they’ll see that their preoccupation with numbers is misleading. Especially as they’re constructed on shaky coatings. Digitising the hospital supply chain will give them accurate figures based on what caregivers actually use. Short chapters, with loads of examples. A great book to understand how a business can become connected to its customers by changing the way it is organised and managed. Felt like a list of success stories without too much depth. Didn't really connect. A very interesting view of organisational design perspectives. Recommended to all digital transformation leaders. Disclaimer: I received this book from O’Reilly Media to provide a book review. Note, there were no conditions attached. The book "The Connected Company" by Dave Gray with Thomas Vander Wal provides an excellent road map for companies to become “connected.” By connected they mean can a company provide a service to a customer the way he wants it, expects it and has a satisfying experience so he keeps coming back and tells others about his good experience, or will that same customer, if he has a ba Disclaimer: I received this book from O’Reilly Media to provide a book review. Note, there were no conditions attached. The book "The Connected Company" by Dave Gray with Thomas Vander Wal provides an excellent road map for companies to become “connected.” By connected they mean can a company provide a service to a customer the way he wants it, expects it and has a satisfying experience so he keeps coming back and tells others about his good experience, or will that same customer, if he has a bad experience, informs his social network about it so they don’t have a similar bad experience with a particular company? Companies face this situation every day in that every experience counts. Companies need to know very quickly what is working well and keep working on improving the overall experience and also know very quickly what is not working well and correct it quickly before it starts losing customers. Things have gotten real tough for companies that are measured on how well they provide service. Since we are a service economy now, it applies to all the companies today. But all is not lost. To survive and thrive, a company must become a connected company; however, being connected is not that quick and easy. It will take time, but companies have to get started soon. As the book proposes that being connected today is no longer a nicety, but a necessity. The reason for this is quite simple: customers have lot of power today that they did not in the past. Lot of this power comes from the pervasiveness of social media and the social culture we live in where everyone has a voice whether it be good, bad or ugly. This is the new reality. Companies can’t ignore it, but have to learn quickly to capitalize it. As the book proposes, the only way a company can play in this level field and succeed is to first understand what has changed, why being connected is the only way to compete and thrive, what does a connected company look like, how does a company manage in this environment and how do you get started before it is too late. No matter how much things change, one thing that will not change is that a company’s success is still predicated on providing an excellent customer service and experience. Companies who take even a single customer lightly do so with great peril. Every day we keep reading stories about how one ticked-off customer can catch executives completely blindsided on how quickly a negative review can spread on social network. Not being connected causes the executives slow to react and leads to not only public relations nightmare but hurts them financially also. This is a rude awakening to lot of companies, small, medium and large. The business as usual is no longer going to work and future success of companies is going to involve not only being connected but how quickly they create a connected culture where a company is able to experiment and create innovative ways of quickly providing services to satisfy customers. One of the interesting point that the authors make in the book is that in order to satisfy a customer as an individual, it can only be done effectively by an individual at the front line who is empowered to make it happen quickly and satisfactorily. Companies that are well connected can repeat this again and again. To accomplish this requires the following: utilization of the latest technology, innovation in management and empowerment of front line employees who are innovative, creative and passionate. To put a twist on the famous quote by the legendary football coach of Green Bay Packers Vince Lombardi, being connected is not a one day thing, but an everyday thing. The authors have done an excellent job in writing this book that I feel is relevant, well-researched, well-written, well-organized, readable, comprehensive, yet not too exhaustive for those who are pressed for time. I recommend everyone read this book so we can all have an intelligent conversations both internally and externally in ways to create a connected company and culture to satisfy customers since, as the book asserts right from the start, they now occupy the most important seat at the corporate table. What can I say? This is a great book! Highly recommended for anybody interested in business, future developments, innovation. Gray gives a thorough description of what a connected company looks like, why they are needed in this era of change, how to develop a connected company. He describes many examples of companies, what went well, where it went wrong. And all very readable in short chapters (chunks of information). I read this book in Dutch for Managementboek (who sends me books for review). 2 What can I say? This is a great book! Highly recommended for anybody interested in business, future developments, innovation. Gray gives a thorough description of what a connected company looks like, why they are needed in this era of change, how to develop a connected company. He describes many examples of companies, what went well, where it went wrong. And all very readable in short chapters (chunks of information). Brilliant Book. Must read for middle level managers. Compulsive arguments for a new form of Complex Adaptive Organisation. I like the way the book is organised. Each chapter is very short 5 pages or less and complete by itself yet a critical piece of the overall assertion. I also like how the author gives examples from real world Companies who are already in such a form. Information Technology professionals, in particular, will love this book. While everybody can leran from this book, Managers w Brilliant Book. Must read for middle level managers. Compulsive arguments for a new form of Complex Adaptive Organisation. I like the way the book is organised. Each chapter is very short 5 pages or less and complete by itself yet a critical piece of the overall assertion. I also like how the author gives examples from real world Companies who are already in such a form. Information Technology professionals, in particular, will love this book. This is really good book to understand how the company works and relation with other company. Many success companies that we never know how the process work inside, which made an open mind on how it works. This also book also very good on leading the company and how efficient on the processes work. The Book really interactive and not boring at all. Author has put lot of diagrams and pictures which help reader to imagine the processes. Great book about the future (or should be the present?!) of the companies. A 21th century company shouldn't be seen as a hierarquical structure but as a network of pods (or cells). Command-and-control management is history and most companies are still stuck at Industrial Age. This book presents cases of modern companies that got the message and gave autonomy to front-line people do the best they can to support their customers.